At Sutphen, we realize that the act of purchasing fire apparatus is so much more than just a mundane business transaction. Everything involved, from the beginning planning stages, to the delivery and acceptance, require time and commitment. We value that substantial commitment you are making with your time. This commitment is why we don't just put our name on our apparatus, we put our hearts into it. Pictured here are all of the Sutphen Family employees, not to mention the rest of the 100-strong workforce that gives an all out effort daily. They have for decades to ensure that we not only make you happy, we keep you happy. Locally in Indiana, we provide you with three field sales representatives and several service options. Our main factory is located in Dublin, Ohio, just outside of Columbus, and is anywhere from a 3-6 hour drive from you. This short distance ensures that we can be responsive to any factory based needs that you have like no one else. 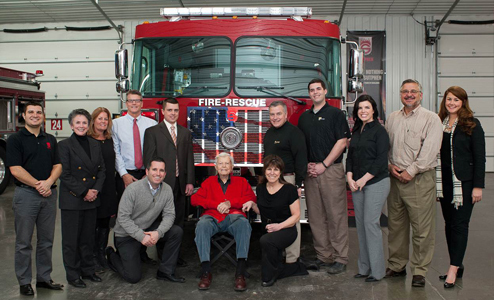 Once your department name is on our fire truck you become a member of our family...The Sutphen Family. Contact us to come see for yourself!